Schadau Park is a pleasant public garden on the shores of the Thunersee Lake in the Berner Oberland in Switzerland. The attractions of Schadau Park include the pleasant gardens with wonderful views of the lake and Alpine peaks, Schloss Schadau – a nineteenth century palace and home to the Swiss Gastronomic Museum and the posh ARTS restaurant, the Thun Panorama 360° painting, Scherzligen Church, Vaporama steam railway, and play areas for children. 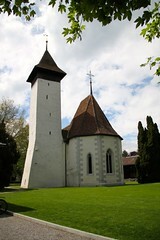 Schadau is in the southern suburbs of Thun, an easy stroll from the old town area, train station and boat landing. Schloss Schadau, at the heart of Schadau Park, is a mid-nineteenth century historicist palace with style elements copied from Loire châteaux and English Tudor and Renaissance palaces. Only the parts housing the museum and restaurant are accessible to the public. The Swiss Gastronomy Museum (Schweizerisches Gastronomie Museum) in Schloss Schadau in Thun houses the cultural records of the Swiss hotel and gastronomic past. It exhibits literature, documents, and gadgets related to the gastronomic industry. Its library with around 7,000 titles includes the smallest cookery book in the world. The Swiss Gastronomic Museum is rather specialized and not a mainstream attraction. It is open only Tuesday, Wednesday and Thursday afternoons from 2 to 5 pm. (Closed on vacation days.) Admission is CHF7. 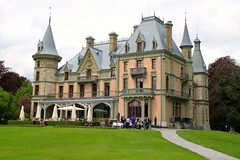 Also in Schloss Schadau is the gourmet ARTS restaurant. This rather posh restaurant with bistro offers magnificent views of Lake Thun and the Bernese Alps in addition to high quality food (14 Gault Milau points). The Thun Panorama is the oldest existing 360° panorama painting in the world. It shows the town center of Thun at the start of the nineteenth century. It can be seen in a dedicated round building in Schadau Park. 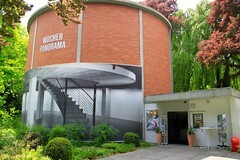 See the Wocher Thun Panorama Painting for more details. 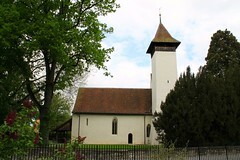 The Scherzligen Church next to Schadau Park is the oldest and historically most important of the twelve millennium-old churches in the Thunersee region. The original church in Scherzligen was erected around AD 500. However, most of the building is newer with the Carolingian tower dating from the ninth century, the Romanesque nave from the tenth century, and the Gothic choir from the 1380. Two-thirds of the interior of the Kirche Unsere Liebe Frau (Church of Our Dear Lady) in Scherzligen are covered by historically significant paintings and tapestries dating from the 13th to 16th centuries. The frescoes in the choir were only rediscovered in 2002. Kirche Scherzligen is open April to October daily from 10:00 to 18:00 but from November to March only on Sunday from 10:00 to 16:00. A small steam railway takes visitors on a ten-minute, 940-m trip through Schadau Park in summer. The narrow-gauge railway operates mostly on Sundays and vacation days between April and October – see Dampfbahn Vaporama for exact dates and timetables. 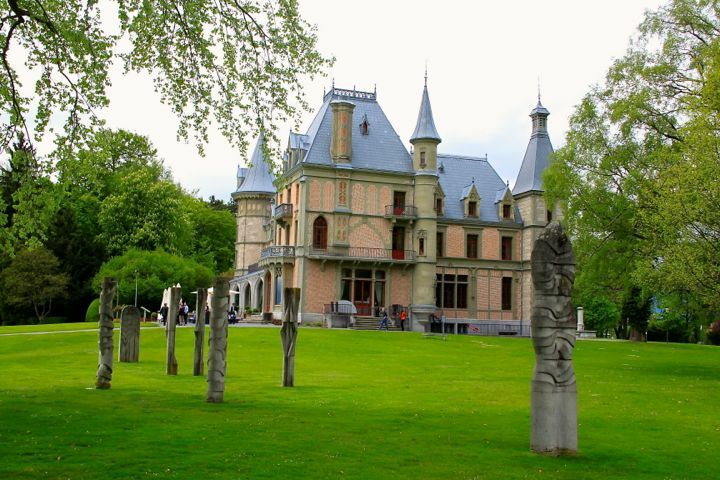 Schadau Park also has a large playground for children with an adjacent picnic area where barbeques are allowed. Getting to Schadau Park is very easy. The park is in the south of Thun on the shores of the Thunersee Lake. From the main train station and Thun old town, follow Seestraße past the boat landing towards the lake. It is around a fifteen-minute walk. Alternatively, use bus 1 to stop Scherzligen/Schadau. Limited parking is available near the church. More photos of Park Schadau.